It's officially summer, and that means it's the time of year many of us are working at full capacity to maximize the business opportunities of the season. A little planning can go a long way, though. Making sure that equipment is running properly means making sure your equipment is in full operational condition and having spare parts on hand, just in case of a break-down and things don't go according to plan. What is a JD9-C Spray Gun? 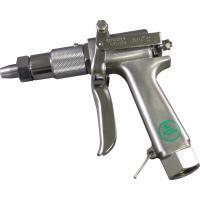 The JD9-C spray gun is one of the most popular spray guns used in the spray industry. It's a heavy duty spray gun with a max of 1,000 psi. Adjustable from a fine mist to a long distance pencil stream by turning the barrel, the JD9-C spray gun has a convenient trigger lock for continuous spraying and comes with various interchangeable spray nozzles and tips.